Reference Radiometer for water disinfection according to DVGW and OENORM. 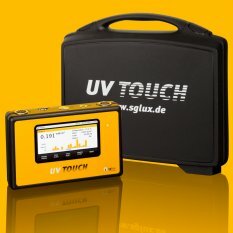 Digital multi-channel UV reference radiometer. UV-DVGW-D or UV-OENORM-D sensor included with customized spectral characteristics. PTB traceable calibration according DVGW W294-3 and OENORM M5873. 100% touch-screen controlled, unitintuitive handling.